This year March Madness was definitely full of surprises and upsets, Duke being one of them. This past season they had an insanely talented team, bringing in the top recruits, we as fans all thought we would be a shoe in for winning the title this year. Unfortunately, I along with every other Duke fan, were let down. It is always heart breaking watching a loss, but being in the midst of it was even worse. In all the games I have attended, I have never been to a losing game. Minus the upset in the end, we still had the BEST time in Greenville. This was a last minute, spontaneous trip. We (Troy and I) bought tickets on selection Sunday the minute they went on sale and left a few days later. We arrived on the Friday they were playing the Troy Trojans. This being our first time in Greenville, SC, we got ready as soon as we got there and went and explored the town. It was flooded with Duke fans, Troy fans, UNC fans, SC fans, etc. (you get the picture). Every corner you looked there was a fan of some sort. This made things extra fun, like going into restaurants or stores decked out in Duke gear (my Frank Jackson jersey to be exact), and seeing all the opposing fans starring at you. Usually everyone dislikes Duke so this was expected, especially since we were out numbered for once. The first game was super fun, with a win by Duke, 87-65 (followed by a victory meal at cookout). This being the Trojan's first NCAA appearance since 2003, their fans were definitely there to support. Beside of us was an elder couple who actually attended Duke university, and they try to get tickets to every NCAA tournament game that involves Duke, according to the wife. Her and I helped cheer extra loud to the UNC fans that were sitting in front of us trying to be a disturbance (what's new). Grayson scored some pretty big points, 21, along with Jayson being the second leading scorer in the game with 18. While there was a day in between these two games, lots of eating and exploring was done that Saturday night. We visited Bad Daddy's Burger Bar and man was it delicious (they had the best sweet potato fries ever). After dinner we went around the downtown area, visited Fall's Park on Reedy River, the news station, oh and jammed out to Drake's "More Life" since it had just dropped. It was such a fun night, the weather was perfect and we even spotted Duke's bus. So of course I had to take a picture (posted below). I was hoping one of them would just randomly forget their shoes or bag and be coming off the bus while I was taking a pic with it.. (a girl can dream, right?). 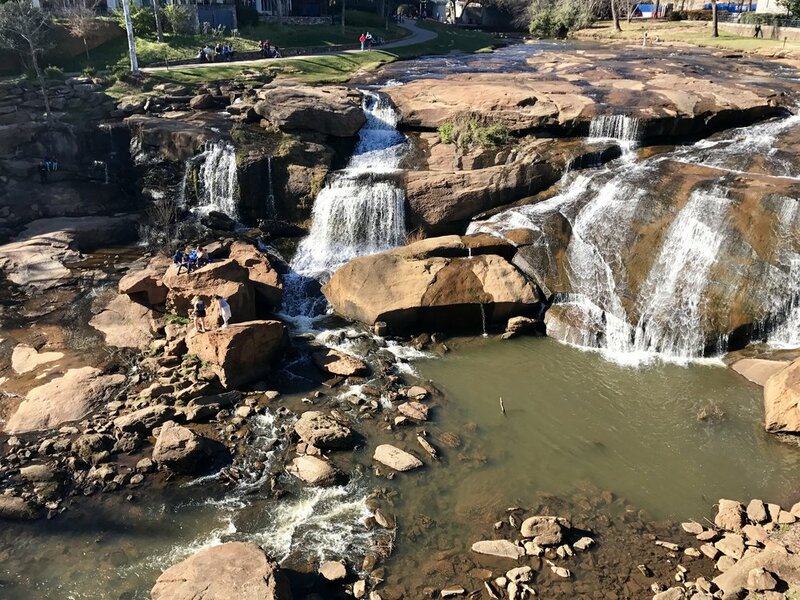 Greenville for sure has some awesome places to hang out, eat, drink and socialize. I thought it was a perfect place to hold the tournament this year. When the next day came around, little did we know, we would be heading home filled with disappointment. Leading up to the game we were full of excitement. I made Troy stop and take pictures of me everywhere we turned, they have the coolest walls and scenery in downtown. I had to document the happiness, and the Jordan one's I was rocking (I'm a big sneaker-head for those who don't know me). When we arrived, we came into a huge sea of UNC and Gamecock fans. At that moment I had a terrible feeling about the game. I didn't want to have false hope but it just wasn't something we wanted to see. It was as we expected, a very hostile game playing environment for Duke. A couple rows down there were some frat boy SC fans, screaming to Amile Jefferson, when his contact lens came out during the game, "aw do you need a tampon?". It's remarks like that, that make me so extremely happy when we win. I like to keep it classy and not respond to immaturity, but it does make it that much harder when you lose to those type of people. I remember Amile and Matt speaking about how they're used to the hostility, they can handle the environment, they just have to tone it out and stay focused. Unfortunately they couldn't stay focused enough as a team. I could see it on they're faces, that they all wanted to win so bad, but it just wasn't working for them. Along with tons of terrible calls and the fans, they just seemed so tired and out of it. With an easy win from the last game, I feel our guys went into this game with a mindset that was more at ease and maybe not as motivated. They also seemed kind of tired/fatigued, the normal rhythm just wasn't there. Even though it wasn't looking good, we held out hope until the end. In the last minute of the game we sat there in defeat. I was in literal tears because it just hurts so bad watching the team you love most, get treated unfairly and be so disappointed in themselves (especially in a sea of UNC fans). As they walked off the court I was even more upset about losing Jayson, potentially Harry, Luke, and Grayson. I knew most of our team wasn't returning, and it was just so crazy how quick it ended. But, that's what happens. You get attached to a team and at the end of the season, most of the players go their separate ways. It's all part of the experience as a fan. It was also hard to deal with because this was such a huge upset. It may not have been expected, but heavily wanted by every opposing team. They sure did rub it in our faces too, which made it even worse. In the end, that is the game of Basketball. It is super competitive. I have learned that it can take a turn at any minute, and anything can happen. As they always say, you win some and you lose some. Even when they lose, I'm always proud to be a Blue Devil fan. Until next years NCAA tourney... go Duke! !